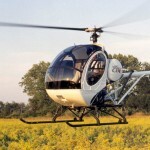 Sikorsky have confirmed to HeliHub.com that they have restarted the Schweizer S300C production line at Coatesville, Pennsylvania, and delivered the first two helicopters from that line in July 2013. Our research suggests these are serials S1954 and S1956 to customers in China. A total of 19 S300Cs are being built at Coatesville, serials S1954 to S1972 inclusive, and all are “contracted to various commercial customers” according to the manufacturer. The balance of the 19 will be delivered between now and the end of 2014, whereupon the production line will grind to a halt once again. Sikorsky are not currently taking new orders for the S300C, although we would expect that now they have gone through the pain, sorry cost, barrier of getting the production line up and running, further enquiries for appreciable numbers of helicopters will be entertained. Quite what the tipping point is for Sikorsky to want to take new orders again they have not divulged, but we would expect it to be 10 or more. Sikorsky Aerospace Services’ Helicopter Support Inc. department continues to provide product support for the Light Helicopters (their capitals, not ours), including the S-300C. Sikorsky say that they expect their customers “to see improved levels of support based on the finalization of the new Light Helicopters supply chain”. That statement implies a realisation that customers have not had as good support as they should expect, and this has been borne out by comments from some operators that have approached us, concerned that their aircraft investment has been significantly devalued by virtue of lack of availability of certain parts.